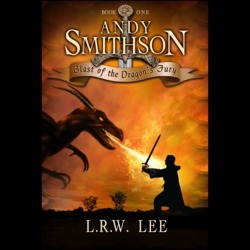 Ten-year-old, Andy Smithson believes he is merely a kid too often in trouble–until his destiny as the Chosen One to break a 500-year-old curse is revealed. Swept away to the land of Oomaldee of medieval times era, he discovers he must collect several ingredients for a magic potion to defeat the oppressive curse that plagues the land, the first of which is the scale of a red dragon, the fiercest of all dragon species. There's just one tiny problem, he's never battled dragons, except in video games. Armed with only his wits, an ancient sword and a magic key, he must overcome grave peril at every turn before he can even attempt the feat. No pressure, but it's his skill alone that will save - or condemn - the kingdom forever. We will send Blast of the Dragon's Fury to your Kindle at . Blast of the Dragon's Fury has been sent successfully to your Kindle!